The second installment of the cycle of grim RPGs, which was launched in 2016. 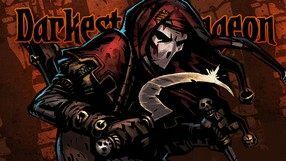 The story told in Darkest Dungeon II focuses on the apocalypse and the hardships of a long, exhausting journey, while the gameplay is based on the mechanics known from the original. Players must, therefore, travel through gloomy locations, facing the dangers lurking there and taking care of the emotional state of the characters. A dark fantasy cRPG developed by debuting studio Red Hook. The story is set in a dark, medieval-like universe. While exploring ruins of an old castle and its dungeons, you face off against forces of darkness that overwhelmed the land because of the reckless actions of its previous sovereign. As you delve into the depths, you discover the dark history of a family who brought the evil upon the world. The gameplay focuses on dungeon crawling - dungeons filled with traps and crawling with monsters that need to be dealt with during turn-based combat sequences. An original idea is the sanity indicator of your heroes. Each team member has different personality and reacts differently to what is happening around him/her. Therefore, while playing you should keep an eye on their well being and fear levels, alleviating their stress by drinking alcohol or brawling, if needed.